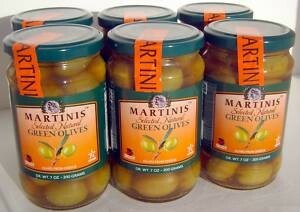 Martinis Premium Green Olives (with pit) are tangy, luscious olives with textures that range from tender to meaty. The Greek Green Olive are perfect for Greek salads, antipasto trays, salads and Mediterranean recipes. 100% Manufactured and Packed in Greece. Pasturized product. Martinis Family Olives have placed #1 ten years in a row for the most tasteful naturally grown olive in the world. Martinis Green Olives are prepared in brine and packed in water, sea salt, and Extra Virgin Olive Oil.